1. Reduce aquafaba from 3/4 cup down to 1/2 cup and refrigerate overnight. Blanch and toast hazelnuts, then grind to a meal. Sift together with almond meal and confectioners sugar. Grind any bits that won’t fit through a fine seive. 2. Begin whipping aquafaba until it forms soft peaks and no longer moves if you tilt the bowl. Add sugar 1 tablespoon at a time, beating 30 seconds between each addition. Meringue will become thick, stiff, and glossy. 3. Sift in almond/hazelnut mixture and add cinnamon. Stir to fully incorporate it. 4. Pipe onto a parchment lined tray into similar sized rectangles. I drew mine on the underside of the parchment paper. If you don’t have time to pipe it perfectly, you can simply spoon and spread it. 6. While the dacquoise is baking, follow the instructions here for making the Swiss meringue buttercream. Add in cocoa powder and melted chocolate once it’s fully combined. 7. Combine ingredients for the caramel in a sauce pan, excluding the vanilla extract. Heat and stir until everything is fully melted over medium heat. Leave over medium heat until it reaches the soft ball stage. You can test in a cup of cool water by dropping a small bit in. Close, but needed a few more minutes. Add vanilla, then stir. Pour into a parchment lined pan and refrigerate for 60 minutes until solid. 8. Make the nutella: grind everything together until it forms a thick paste in a food processor. 9. 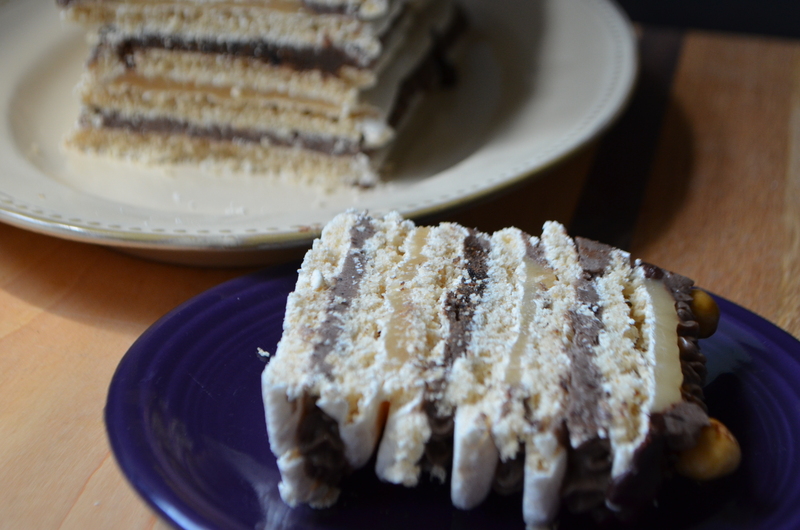 When dacquoise is cooled, pipe buttercream around the edges of 5 of the rectangles. Fill two with buttercream, one with hazelnut spread, and two with caramel. I found it easiest to cut the caramel and peel the parchment off the bottom. 10. Stick each layer in the refrigerator and stack once they have cooled. 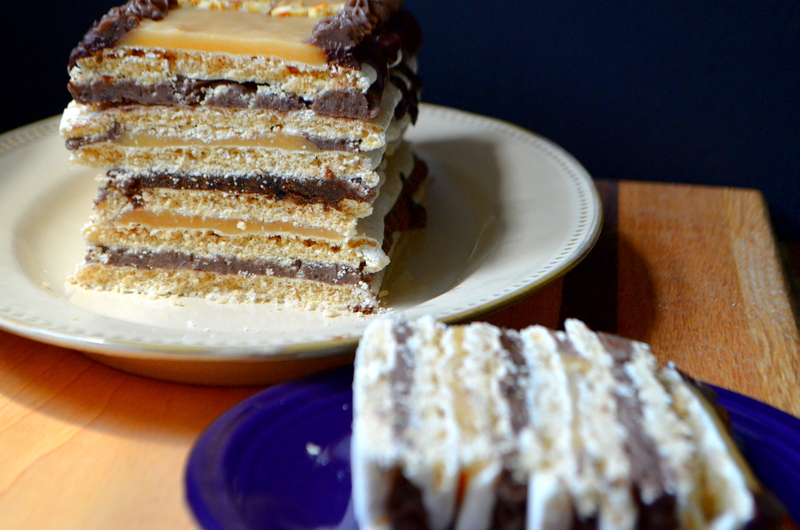 Top with the last dacquoise rectangle and caramel. Drizzle the warm chocolate ganache down the edges, cool, then pipe buttercream on top and add nuts as desired. oh my god!!! EVERY FRICKIN TIME!!! damn you, avocados and ales!! I know!!! I’ve eaten so much cake in the past two weeks but I’m not even sick of it yet! This looks so wonderful! You got me at ganache! My omnivore parents were impressed! Could it be put into the freezer?